Look, some of us can’t afford your fancy three-course working man’s lunch, or your elitist bed frames, or your “Oooh, look at me, I’m a trust fund baby!” metal cutlery, alirght? And we certainly don’t have thousands of dollars to shell out for a real wooden pipe! So when needs must, whatever you have must provide, okay? Or do you not understand that, what with your 8th grade education and hoity-toity collection of dictionaries?! 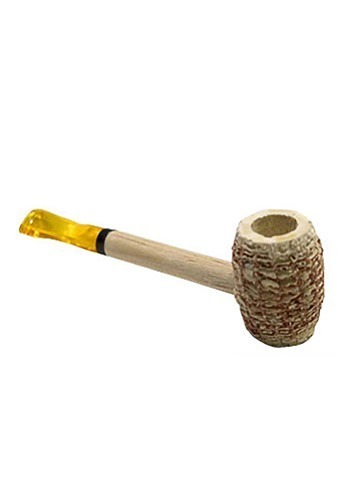 So yeah, we got ourselves a corn cob pipe, and guess what? It works just as well as anything you soft-palmed Ivy Leaguers could ever come up with! It's got hollow bowl that we carved out ourselves - ya get that? That's right! We work with our hands around here, and not just to lift our silver spoons up to our mouths and then back down to bowls full of lobster bisque! And it's even got a plastic stem, which lasts longer than wood. So how do ya like them apples, huh? Yeah, that's right, to on and go! And take your fancy "I've got a shirt and pants" attitude with you, too!